An herbed gluten free biscuit topped with a kale pistachio pesto, fresh vegetables and chicken. In a small bowl, cut shortening into baking mix to form pea-sized particles. Mix in milk, eggs, 2 teaspoons thyme, 2 teaspoons rosemary and 1/2 teaspoon salt. Drop by tablespoonful onto a baking sheet. Bake for 12-15 minutes or until golden brown around the edges. Meanwhile, in a large skillet, heat 1 tablespoon coconut oil over medium-high heat. Add chicken, 1 teaspoon salt, pepper, remaining 2 teaspoons thyme and remaining 2 teaspoons rosemary. Cook until chicken is almost done, about 6 minutes; then add 1 tablespoon coconut oil, zucchini, onion, mushrooms and pepper. Sauté until onions are translucent, about 5 minutes. Stir in spinach and remove from heat. Melt remaining 1/4 cup coconut oil in microwave for 20 seconds. Reserve. In a food processor, combine pistachios, kale, garlic and remaining 1/2 teaspoon salt. Slowly pour in coconut oil, process until combined. 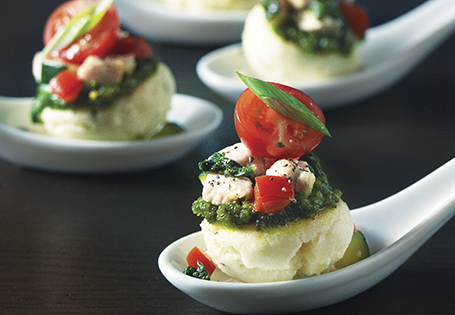 To assemble: Spread pesto on biscuit and top with chicken and vegetables. Garnish with green onion and cherry tomato.